As a member of multiple organizations on campus like Black Student Union and the Meredith International Association, Jada was able to connect with a group of like-minded women from different backgrounds. Before Meredith, Jada was wary about opening up with people, but through joining these clubs she was able to allow herself to welcome new people into her life and build bonds she never would have made in her hometown of Jacksonville, North Carolina. The support from students and faculty helped Jada strive to push herself out of her comfort zone and open herself up to experience things she never thought she would have the opportunity to do. She expanded her journey off Meredith’s campus by taking a summer to study abroad in Costa Rica with the biology department. While abroad, she fell in love with her experience researching leaf-cutter ants in her Tropical Ecosystems class, studying how microenvironmental conditions affect the leaf-cutter ants’ transportation of their leaves. With her future career goal of dentistry in mind, Jada took as many opportunities as she could to use her college experience to better prepare herself for this career. 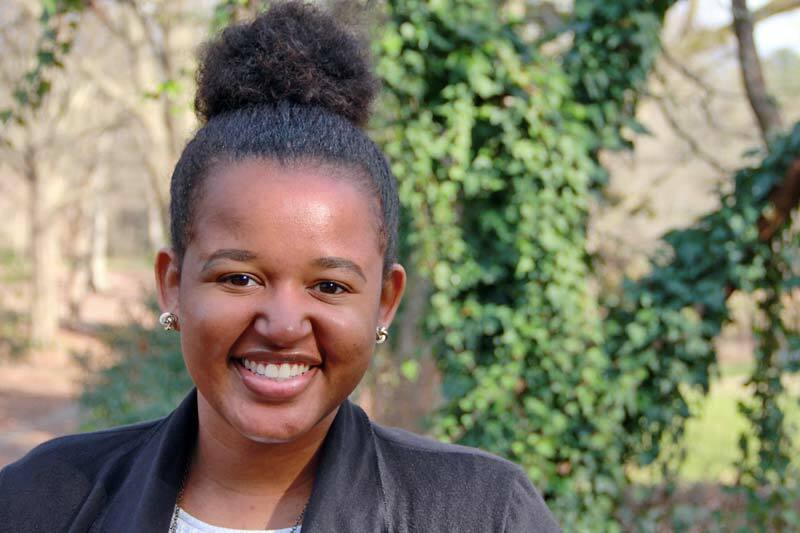 Jada took her love of dentistry and found a way to incorporate it into her communication research by studying the relationships between dentists and their patients for her thesis. Jada volunteered at Wake Smiles to gain experience shadowing dentists and what their day-to-day job entails. She also interned with Meredith’s Health Center under Dr. Mary Johnson, where she worked to promote wellness within the Meredith community through social media campaigns, the formatting of new forms for the Health Center, and setting up the wellness festival. Jada was amazed by how much the faculty and staff have made an impact on her time here at Meredith. She found her biggest supporter and role model in Assistant Dean of Students Tomecca Sloane. “I can always count on Tomecca to be there for me whenever I need it. I count on her to give me the best advice, to guide me in the right direction, and to be a role model for me,” said Jada. Throughout her time at Meredith, Jada has embraced the strong, ambitious woman that she is and knows that this newfound confidence will better prepare her for her future.